Oh my god, thank you for this!! Excellent, thank you for giving this to the world. 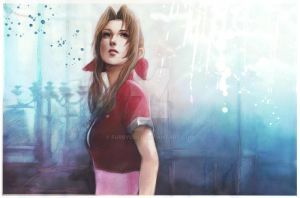 One of the best Aeris picture I have seen in DeviantArt. Nice work, she can use some negative space above her head, she is looking a little cramped. Aerith Was So Beautiful Until Sephieroth Came Out Of Nowhere And Stabbed Her! Awesome, it totally looks like a piece made by Nomura! This is also totally beautiful, I really love this! Not enough words for this. ..... dear god not again. I already noted her. Although she didn't reply to me, I found out that she deleted it. i'm glad that it got deleted. oooohhhhhhh, this is based off her Sprite portrait in Dissidia 012 right? yes~ ^.^ it was kinda hard since her icon is so small. who knows, maybe Aerith will be playable in the next dissidia, rather than just an assist. would be cool! Aww, she's so pretty. I really love her expression - it looks so hopeful and a bit dreamy to me. Finally, you made it, after so long. Glad you followed the advice. I would have liked FFVII better if they killed Cloud. Cloud is by far the worst protagonist in the franchise. Ah I just saw this. Well would you still be able to colour mine? 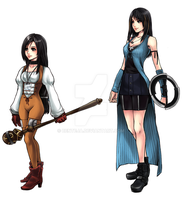 or at least have atutorial on how to colour like Nomura? Hello~ try imitating his color by analyzing it~ (not being helpful haha) practice makes perfect! She looks just like the portrait of her in Dissidia 012. It looks amazing, you drew her perfect.